Five water and sanitation projects have been completed: Las Cruses in 2010, El Bijague in 2011, Las Mercedes in 2013, and La Conquista and LaTrinidad in 2016. The next project will be in La Laguna, a village of 163 families in Esteli. distribution system. La Conquista is a small village of 101 homes in the San Francisco Libre Region. It is one of the 30, mostly rural, villages that the Amanecer Mobile Health Clinic calls on. The clinic medical staff reported that they were treating the children for water borne diseases and a test of the community well indicated the presence of E. Coli bacteria. In prior water projects our design was for a new or refurbished community well. However, we learned that this approach would not work in La Conquista since many of the homes had private shallow wells and it was not feasible to address all of them. The answer for La Conquista was a home filter system that we have been using as a pilot project at 12 homes where our health aides live. The filters are effective and well received by those using them. The product is the Sawyer Point One Filter- it can produce pure water at the rate of 17 gallons per hour, sufficient for even a large family. The filter works on the same principal as kidney dialysis equipment and it removes all bacteria and parasites. The cost of a home filter and buckets is $47.00- imagine that, you can provide pure water for a family for less than the price of a good dinner for two. The Aldersgate United Methodist Church in Chelmsford , MA raised the funds for the project and brought the filters to the village in April 2016. The photos show the team providing the filters for every home in the village. Our medical staff has tested the community water source in 26 villages and 19 of them tested positive for organic contaminants. Our task now is to identify which ones have the most serious problems and then design and prioritize solutions. This will be a combination of wells, catchment systems, filters and double pit latrines. The second greatest cause of infant mortality in the world is contaminated water and poor sanitation. Many Nicaraguan communities have a high mortality rate for children under the age of 5. The Nicaragua Covenant, through the support of faith communities, private donors, and other charitable organizations, helps sponsor water projects in Nicaragua. Las Mercedes, the largest of the four projects, is a community where over 200 people shared six old latrines and walked over a mile up a hill to get water. Through the NGO El Porvenir, a spring catchment system was installed,with a chlorinated holding tank, and a spigot at each house. All the labor was provided by village volunteers. The Covenant also provided a double-pit latrine for each of the 36 houses, with the community doing all of the labor. In 2014 a team from Trinity UMC from Springfield, MA completed the work in Las Mercedes with a reforestation program and new efficient wood burning stoves. What would you do for a drink of clean water? The people of the village had a choice of using the polluted river water or traveling over a mile up a steep hill to a spring where the water is pure. Carrying 5 gallon buckets of water multiple times a day keeps children out of school. Methodist Churches in New England raised the funds to buy the materials needed to pipe pure water down to the village. All the labor was provided by the villagers. They had to carry 20,000 pounds of cement, 20,000 pounds of sand, and all the pipes up the hill. They also has to hand dig a trench 3 feet deep all the way down the hill to bury the pipe. It took 30 men two months to complete the work, with the village women bringing them meals to keep the work going. The end result is faucets at each home, bringing pure spring water to everyone in the village. Stories from the people who have benefited from the projects. I am a Housewife. 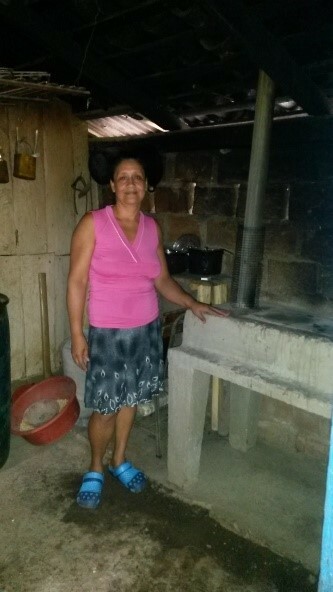 For me the Stoves Project provided by the Nicaragua Covenant meant a lot to evade the many illnesses caused by the smoke when making tortillas. Before we had traditional stoves which created a lot of problems because of all the smoke and we used a lot of firewood which hurt the environment. Now with the new stoves we have there has been a lot of change in the health such as less breathing problems and we are cutting down fewer trees in the community.All the families in the community feel very grateful to all the persons who helped carry out this project of great importance to our community. We hope in God that we will continue building friendships and projects and benefits to all the communities. My Name is Seneyda I am the wife of Omar and we have 2 sons. For me personally and for all of the community the latrine project has made a great significance. Before we had the new latrines, we did our necessities in open air and contaminated the environment. This caused lots of sickness such as parasites which caused diarrhea in all the people principally among the children. We have seen a big change since the latrines were built, and now there is rarely anyone with diarrhea. Also there is a difference in that all the families use the latrines. People are healthier. All the families in the community feel grateful towards the people who have supported the implementation of this project. It is of great significance to our community. We hope God continues to keep us in communication, and we maintain the bonds of friendship, in spite of the distance that separates us. Thank you! 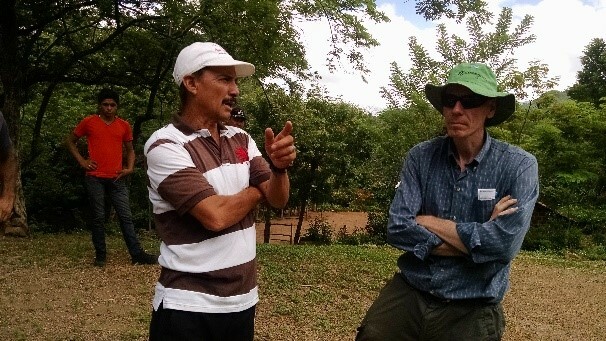 Simon pictured here explaining the situation with a recent drought in his village to the Nicaragua Covenant's Director of Mission Teams. ​My name is Simon and I am the Community leader of the village of Las Mercedes. For me it has been very important to represent the community in all of the projects that we have achieved in the community. The Water project is the most important of all the projects for all of the people. Before the Nicaragua Covenant and El Povenir constructed the well and purification system, the people were drinking contaminated water which caused sickness among the community such as diarrhea, fever, flu and other ailments. Now we are able to drink clean water, and we have seen a big change as there is less sickness in the community. The men and women can work, and the children can go to school without being sick. The community feels a lot of gratitude to all the people who supported and contributed financially towards this project which has made a great impact on all of the population in our village.